We've got a great new sketch this week at Sunday Stamps! Autumn is almost over here in Alaska so I decided to go will a fall themed card. My craft room looks out over my backyard so the last few weeks I've been distracted from crafting by watching the leaves fall from the trees! I used patterned paper from Lawn Fawn along with their Small Stitched Leaves set. I love these leaves, they are so pretty! The colors I used for the leaves were pulled from the patterned paper. 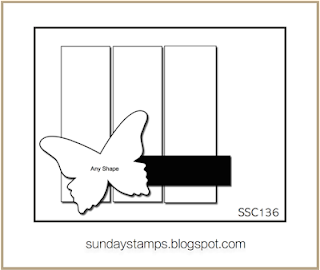 Head on over to the Sunday Stamps blog to see what the rest of the DT came up with and then play along with us, we'd love to see your interpretation of the sketch!